Standing on the 16th green, Dr. Jon Valuck took off his sunglasses and hat, ready to congratulate opponent Kirk Wright on his successful defense of the Oklahoma Golf Association Senior State Amateur Championship Thursday at Oak Tree (East) Country Club. Not so fast. Wright saw a short par putt slide past the hole. Valuck, who had been down by at least two holes since making a mess of holes 2 through 5 after an opening birdie, rebounded to win the par-3 17th with a birdie from 5 feet, and claimed the 18th as well when Wright failed to get up-and-down from just short of the green. Suddenly a match that Wright had controlled almost throughout was going to extra holes. Valuck, a heart surgeon at Oklahoma Heart Hospital, gave himself a chance to win his first OGA individual title, leaving his approach in the first playoff hole 9 feet below the hole. Wright, however, put his two feet closer, and after Valuck’s birdie effort just missed, drilled the 7-footer in the center of the cup. The 1-up victory was Wright’s third in this event, and marked his fifth straight appearance in the finals. The recently retired firefighter from Oklahoma City has now matched Mike Hughett of Owasso with three State Senior Amateur crowns, a feat which he said meant a lot to him. “Mike has set a great standard, and it feels really good to match him with three,” Wright said. Wright had reached the final with two nip-and-tuck victories Wednesday, 1 up over Blake Gibson of Yukon in the quarterfinals and a 2 and 1 victory over John Stansbury of Edmond in the semifinals. Stansbury defeated Wright for the title in 2014 and Hughett edged him in 2015 before Wright won it over Lawrence Fields in 2016. Valuck started the final match with a birdie, but then had two bogeys and two double bogeys over holes 2 through 5 to hand Wright a 3-up lead before reverting to his normal steady play. Wright made all pars until a bogey on the par-3 eighth allowed Valuck to close within two shots at the turn. But Valuck gave that right back with a bogey at 10 and Wright led by three from there until Valuck’s run on the final three holes. 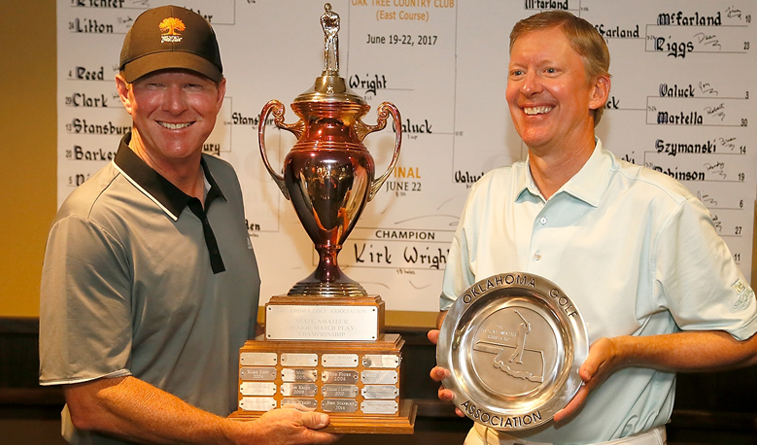 Valuck and Wright won a four-ball tournament together at The Gallery in Tucson, Ariz., and Valuck is a three-time champion of the OGA Four-Ball Championship, teaming with James Reid each time.